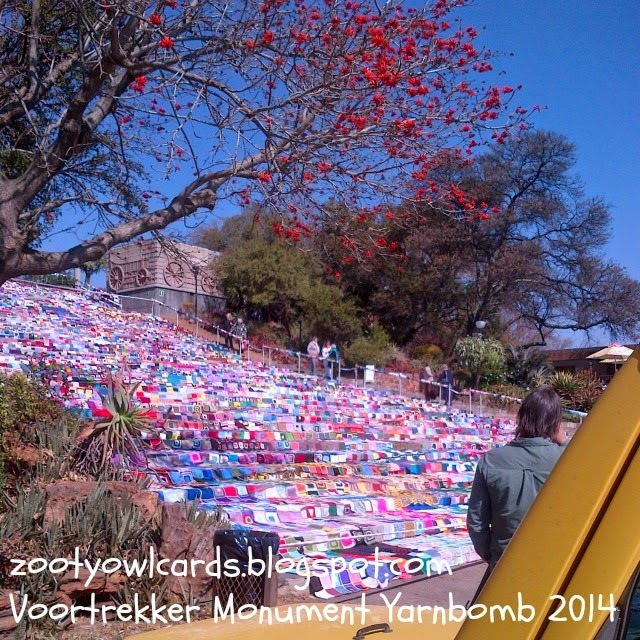 The day of the great Yarn Bomb (1 August 2014) finally arrived and hubby and I set off to Pretoria. 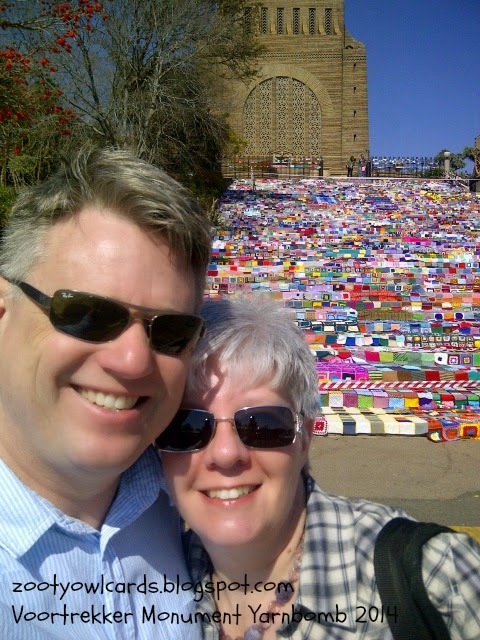 The last time we visited the Voortrekker Monument was about 28 years ago (before we married!). After the Garmin got us lost a few times, insisting we turn where there were no turns, or make a u-turn in the face of oncoming traffic, and attempting to send us up a dirt road we eventually arrived at the Monument. OH MY!! OH MY! So much yarny awesomeness!!! I have never ever seen so many granny blocks! We had to behave like tourists and get a "selfie" at the foot of the stairs with the most spectacular display of colour in the background! In order for the world record attempt to succeed a total number of 19050 blocks of 20cm x 20cm and 3350 blocks of 15cm x 15cm were needed. 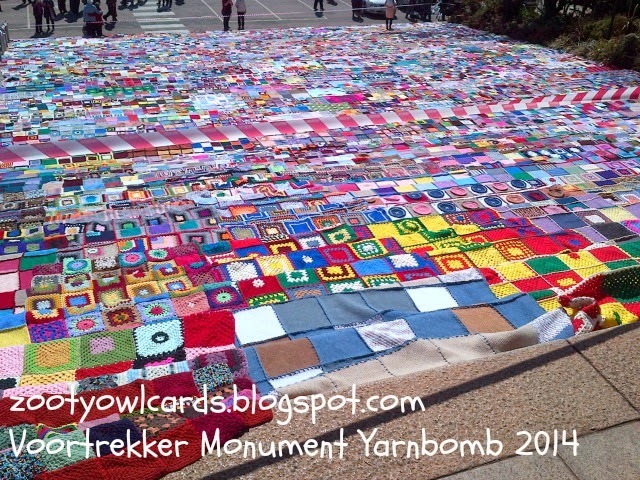 By 14 July 2014 a total number of 27 803 squares had been collected (according to the Yarn Indaba Facebook Page). A total of 657 blankets were made which will be gifted to various charities when the Yarn Bomb is dis-assembled this afternoon. So many beautiful, colourful blankets, worked together so neatly. What an amazing privilege to have been able to witness this!!!! I am one happy lady!! YARNDALE is a wonderful wooly festival held in the gorgeous market town of SKIPTON in North Yorkshire, England! I was completely in awe of the fantastic 2013 YARNDALE BUNTING - some 6212 crochet granny triangles from all over the world strung up in a fantastic display of colour! A wonderful feat organised and co-ordinated by Lucy of Attic 24. WOW! I thought to myself - how amazing it would be to be able to participate in something so COOL!! AMAZINGLY this year I actually do get to play a teeny tiny part in Lucy's vision for Yarndale 2014. I made three designs - thinking Lucy would select one of them! She loved all three! How chuffed am I??? 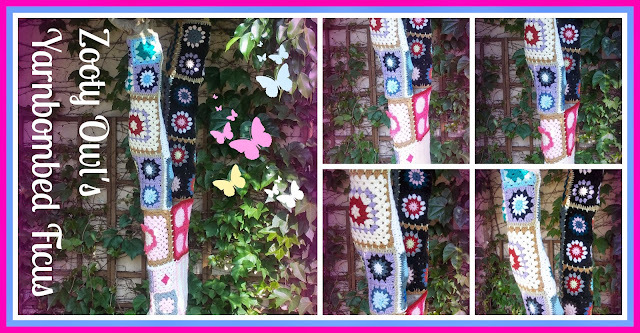 The details of the yarnbomb are all in Lucy's latest Blog post - make one, or two, or three and send them off to Attic 24 - and be a part of this exciting project!!! Don't forget to make a few for yourself too!! 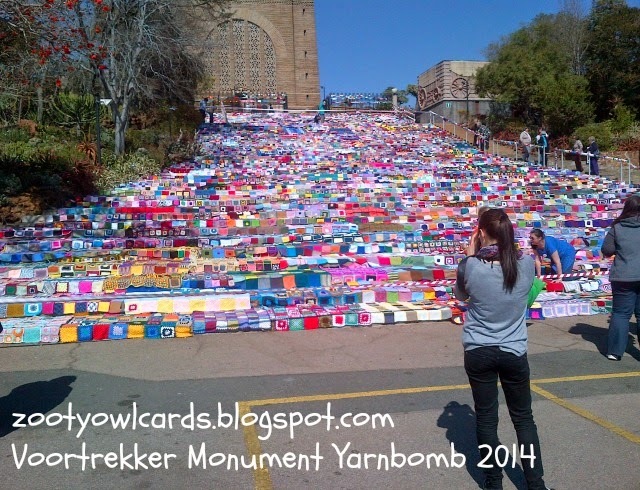 Yarn Indaba 2014 - Yarn Bomb World Record Attempt! 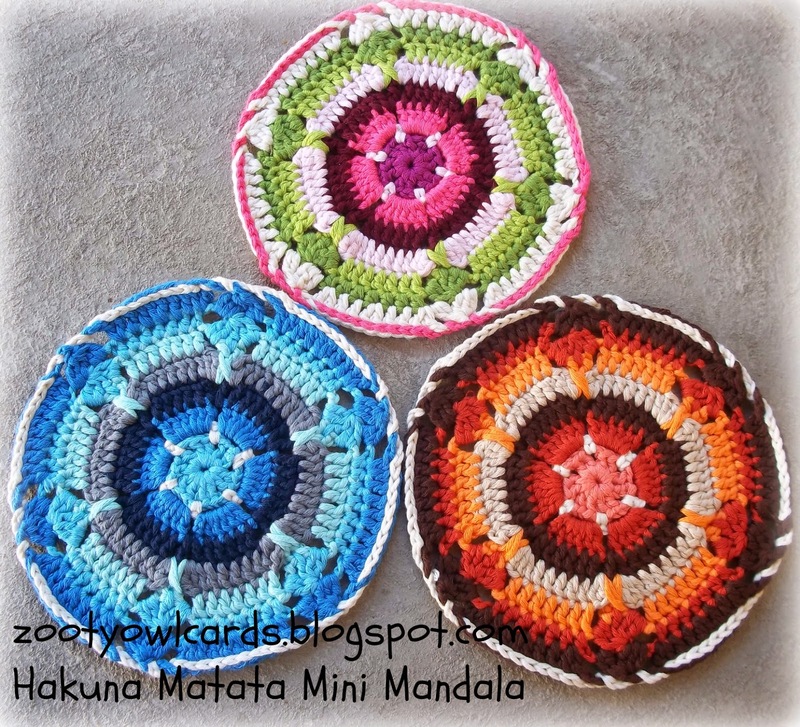 I am jumping in a little late with this post - by now Yarn Indaba is not new(s) - all and sundry have already picked up their crochet hooks and knitting needles and are frantically making blocks for the World Record attempt at the largest yarn bomb. Yarn bombing, yarnbombing, yarn storming, guerrilla knitting, urban knitting or graffiti knitting is a type of graffiti or street art that employs colourful displays of knitted or crocheted yarn or fibre rather than paint or chalk. I decided to "merge' the two scrap buster projects I had going to see how many squares I could make for Yarn Indaba! I LOVE how colourful the tree looked! I can just imagine how fantastic it must be to create a BIG yarn bomb!! The squares are once again neatly stacked and ready to play their part in the biggest Yarn Bomb ever!!! Frantically finishing up some more WIP's so that I can make more squares for Yarn Indaba!